Discussion in 'Effects, Pedals, Strings & Things' started by smokehouse4444, Apr 24, 2016. Howdoo all! 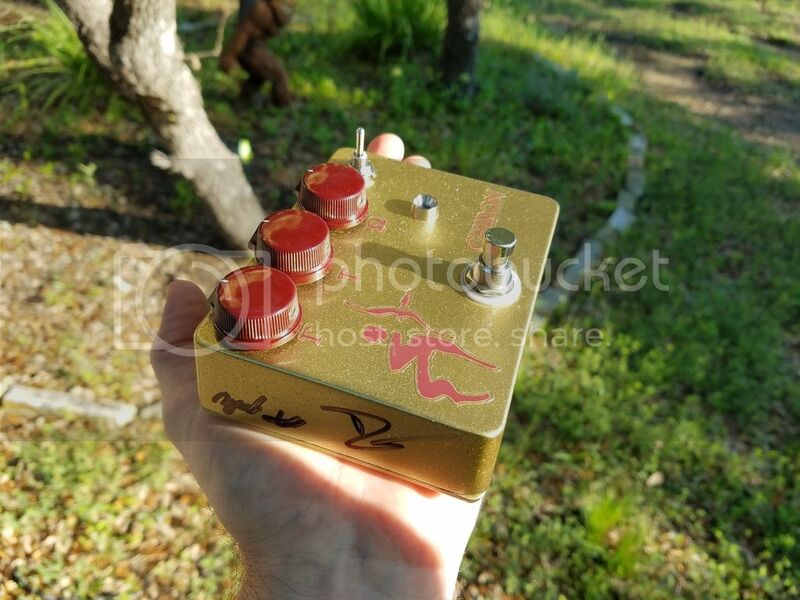 I received my new Klon(e) the other day, and so far I'm really excited about it. It seems to be a very versatile pedal that I will enjoy having at the end of my chain on my stay at home BigRig board. 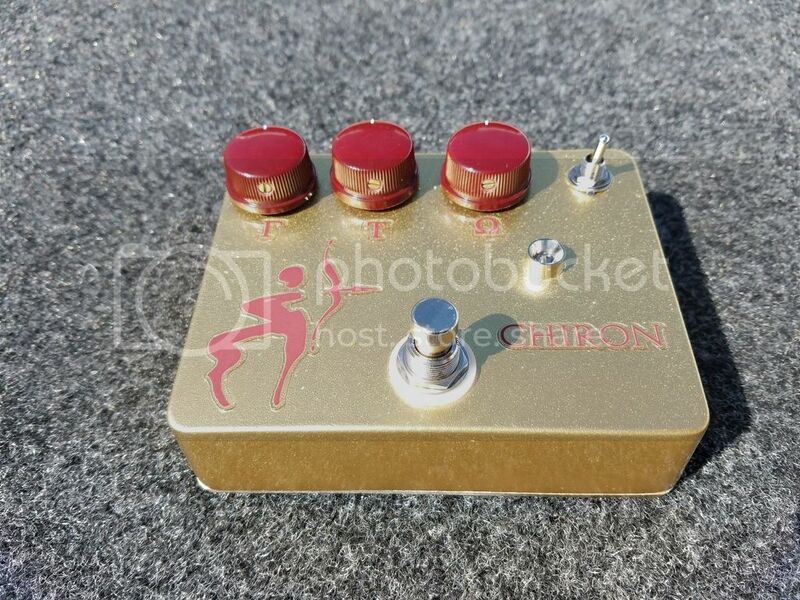 My tech friend who occasionally works on my guitars and/or pedals makes Klon(e)'s for friends. Normally they are in regular brushed metal housing, with four knobs and no on/off light. I talked to him about making me one that I would paint and adorn, with three knobs and a switch for different diode options, along with an on/off switch light. I painted the first box with the Dupont Copper System. The photos you see often look like a chrome-like copper, but the reality is it does not look like that at all, it looks more like the paint on my most recent BA Scarab acquisition. I gave him that box and told him he could use it how he sees fit, and went with another plan. I painted the new box metallic gold, and added a sparkly clear glitter spray before applying the decals and sealing it. I have taken pic after pic and just cannot get it to properly show how it sparkles...and man does it in the sun light in particular. I looked into waterslide decals, but just couldn't find what I was looking for...besides, the guy who is somewhat known for doing them for guitars was a bit of a douche, so I moved on. There are too many people out there doing business that I certainly don't have to deal with the jackasses. So I moved to vinyl decals. I have used a decal company from Pennsylvania (I believe) for motorcycle decals before, but they were really taking a long time to respond to any emails, and basically were saying that they have big orders and my little order was not important enough to deal with. Good enough. I talked to a company in California and they were fantastic; they happily did the design exactly as I asked, and were very fast. The name "Chiron" is the name of the King of the Centaurs, so it is my little tongue in cheek play with some others. The upper switch position is stock D9e, the middle is a Lifted/OP-Amp, and the lower is an Asymmetrical/IN4148. 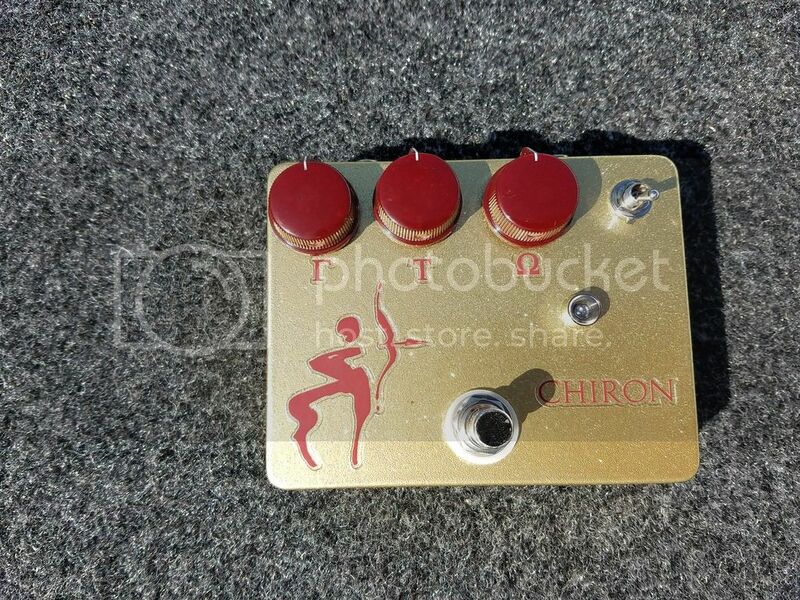 Apparently the D9e is the most Klon-like, but that middle position is smokin'!!! It will take me some time to work with all the different settings, but lots of versatility here. 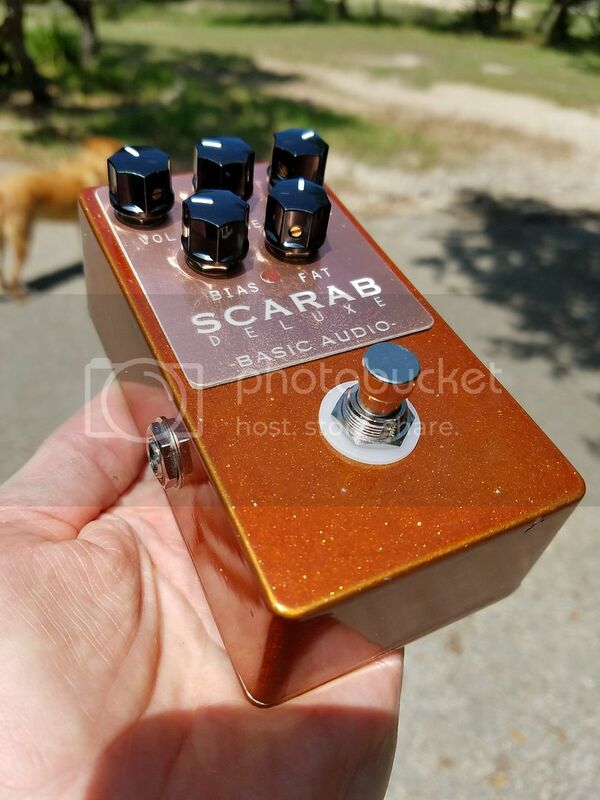 Also, I received my Basic Audio Scarab Deluxe back from him with a new switch...I cleaned that puppy up and it is ready to go and sounding good! Imperial_Tone, tdump, chankgeez and 3 others like this. Excellent name choice as well, since Chiron was, most probably, the most famous Centaur in Greek Mythology. Paired with Greek letters for the controls, nice touch. Thank you Hector, I appreciate that. I pondered quite awhile as to whether to use the K or the C spelling for Chiron. Awesome pedals! Love the name Chiron and the color is great. Myself, I would name it Firenze after the centaur from Harry Potter. Your Scarab is legit the prettiest color I've ever seen them. I do like my hammered bronze w/ gold plate Scarab as well, but yes, I think the coppery paint w/copper plate is very different and cool looking. I'm glad I took a chance on it. On a personal note, I think the coolest looking Scarab I've seen is the Turquoise/Blue paint w/Copper plate. Man, that thing is awesome to me and I looked high and low for one, but not to be found. 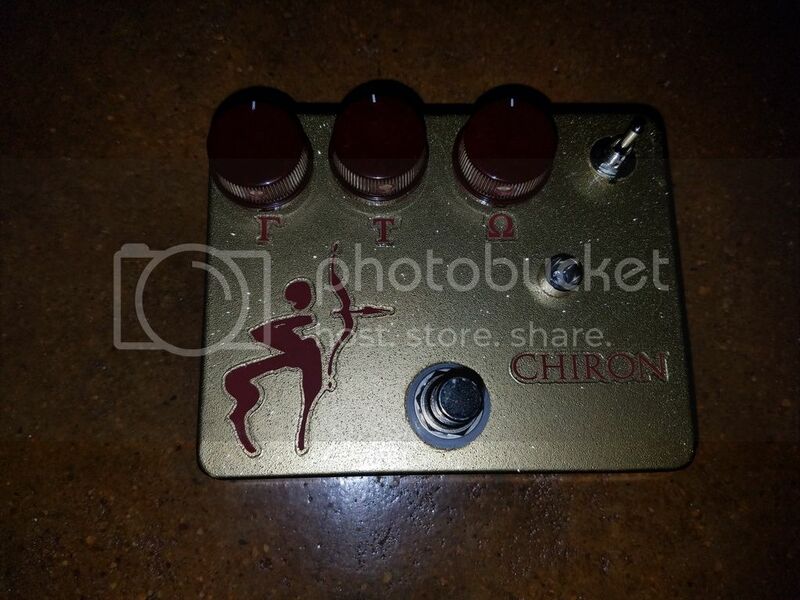 On another note, the Chiron is really sounding good. I have a LOOONG way to go to figure out all of the different tones and sounds that I like, but so far it is really sounding good. I do have to be careful as the volume levels between the three switch modes can be very different. Think I'm going to have a lot of years playing around with this one.